Sometimes it’s nice to look back! Here is one of my favourite true stories from a while ago. If you saw the headline. 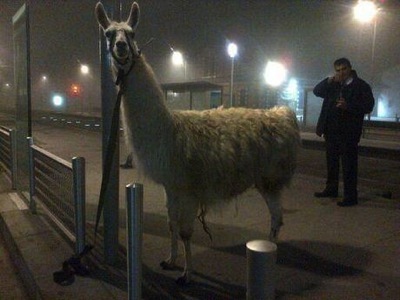 You wouldn’t believe it and not because you know that Llama’s prefer taxis or anything like of course. But it’s true a group of five tipsy French teenagers have recently been arrested after drunkenly, and not mistakenly, stealing a Llama from a circus. 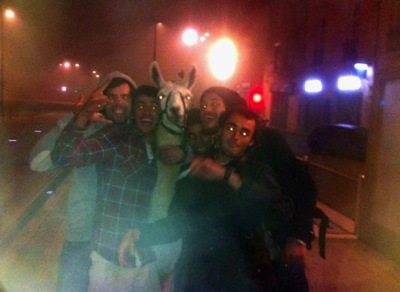 The Llama, named Serge, was taken by the naughty inebriated teens on a tour of Bordeaux via the city’s tram system. It isn’t clear whether this was the Llama’s first choice of scenic tour because sadly no one seems to know which transport system Llamas prefer! Apparently Serge was abducted by the toasted teens in the early hours of Thursday morning after they had finished having a boozy evening in a local nightclub and for reasons better known to drunken teenager had wandered into a closed-down circus. As Mathieu, one of the groggy gang explained later. Taking a Llama obviously seemed like an astonishingly good idea at the time, but apparently the group had originally really set their hearts on taking a Zebra. Sadly the unnamed Zebra proved too stubborn and didn’t want to leave the circus so the hammered five contentedly settled for Serge who was altogether more sociable and seemed up for a night on the town. As these things do, it suddenly occurred to one bright spark that they should take Serge on a tour of Bordeaux and of course everyone knows that the best way to see any city is by tram! Sadly after a while the happy group of six were rumbled by a ticket inspector, though it was a group of passengers who informed on Serge and his new pals and their late night tram ride. This was all too much for Serge and he started to panic, “he moved along the tram and we couldn’t hold onto him,” Mathieu said. “The inspector made him get off and tied him to a lamppost. Reports are confused as to what happened next but it does seem as though the teenagers said goodbye to their new friend and left him leaving him in the care of the tram inspector. It wasn’t long though that the long arm of the Gendarmerie caught up with the bad lads and they were taken to a local police station to explain themselves, something that probably became more ever difficult as they sobered up. The group will not be charged for the late night caper and apparently Serge is no worse for the adventure was fit enough to perform in his usual routine at the circus on Thursday despite his late night out. There is no word of whether Serge would like to be taken out more often, but this Cat thinks that it would be nice for him to get out more, maybe next time on some sort of day release! I wonder how Serge is now?